This article first appeared in The Edge Financial Daily, on March 20, 2019. KUALA LUMPUR: The rising gig economy and an ageing population are expected to cause a decline in the percentage of workers who contribute to the Employees Provident Fund (EPF), according to its chief executive officer (CEO) Tunku Ali-zakri Alias. “There might actually come a point in time in our lifetime when the EPF might no longer exist, because the amount of money being taken out will no longer be able to [be] supplanted by the amount of money coming in,” said Tunku Alizakri at the Invest Malaysia forum here yesterday. The gig economy is a labour market characterised by the prevalence of short-term contracts or freelance work. This is as opposed to permanent jobs where private sector wage earners contribute to the EPF while civil servants have public pension coverage. With Malaysia set to become an ageing nation by 2030, contributions to the fund could decline as more people retire and withdraw their money. Hence, among the immediate challenges for the pension fund is to convince contributors to keep their money with the EPF and for the fund to remain relevant amid a changing labour market. “I told my team we need to have more products and services ... so we [could] convince them (retiring contributors) to keep their money with us,” he said. “We have to convince them to keep their money [with us] and not to take it all out at one go ... but they can do so on a monthly, weekly or annual basis,” he added. 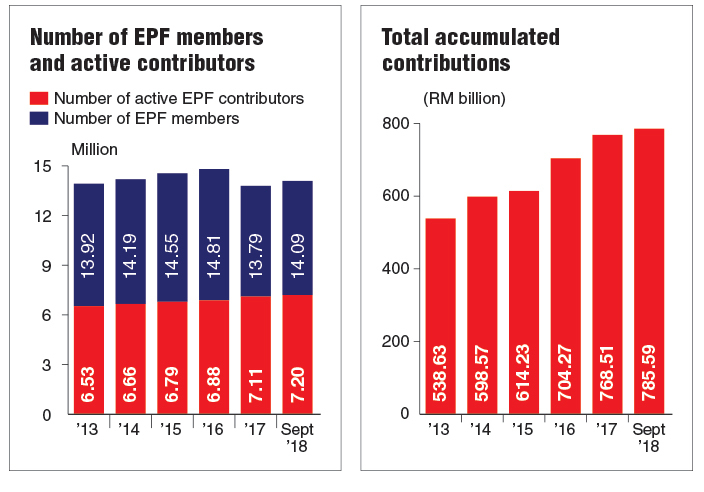 From the contribution perspective, Tunku Alizakri said fewer people want to put their money into the EPF as the younger generation appears to have the mistaken notion that contributions to the fund are a form of taxation, which highlights a need to educate them on how the fund is actually helping them save for retirement. “Another challenge, from the EPF’s perspective, is [how] to manage the funds really well and be able to give returns which are superior to the other institutions out there,” he added. Meanwhile, the EPF’s mandate remains that of safeguarding and growing its members’ funds, said Tunku Alizakri, who was speaking during a panel discussion on the role or mandate of government-linked investment companies (GLICs). He said he has also highlighted to the government that the fund’s obligation is to its contributors, and not the rakyat at large or any political masters. “Whenever the politicians come and give talks in EPF itself and they say, Oh jangan lupa, ini adalah duit rakyat (Oh, don’t forget, this is the people’s money), we remind them that with all due respect, Ini adalah duit ahli, bukan duit rakyat (This is members’ money, not the people’s money),” he said. Also at the discussion was Khazanah Nasional Bhd managing director Datuk Shahril Ridza Ridzuan, Permodalan Nasional Bhd (PNB) CEO Datuk Abdul Rahman Ahmad, and Kumpulan Wang Persaraan (Diperbadankan) (KWAP) CEO Syed Hamadah Othman. Shahril said although it would seem that cash from any sale of its assets goes directly to the government, most of it is actually redirected to the fund’s coffers. “The only cash that is upstreamed to the government is our annual dividend payout,” he said. “The composition of our asset classes will change,” Tunku Alizakri said, adding that the EPF has been keen on expanding overseas, which has seen it recently testing the waters in Latin America with small investments. “The fund has some 26.7% of its assets invested overseas (as at 2018),” he said. The other three GLICs are looking to shift their focus towards the private equity markets to enhance asset allocation and accelerate asset diversification. The indication is a need to diversify and increase their global assets. Abdul Rahman reiterated that PNB’s 22% cash holding is inefficient, and that his fund is looking into allocating more cash towards private equity and real estate investments, as well as shifting more assets overseas. Less than 2% of PNB’s assets were invested overseas when Abdul Rahman assumed the CEO’s position in 2016. Similarly, Syed Hamadah said KWAP is looking into more private equity investments going forward, as well as an expansion of its mandate to invest more overseas. “We’re interested in properties [such as] student accommodation, office blocks and logistics [locations],” he said, when asked what kind of overseas investments KWAP has its eyes on. The civil servants’ pension fund currently invests 87% and 13% of its assets in domestic and overseas instruments respectively, Syed Hamadah said. Nevertheless, both the EPF and KWAP must engage with Bank Negara Malaysia before increasing their overseas investments, as their mandates for overseas investments are subject to the central bank’s regulations, according to the CEOs.